For the second straight season the Nashville Predators will advance to the second round of the Stanley Cup Playoffs. 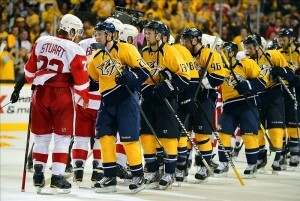 The Preds defeated the Detroit Red Wings 2-1 in game five to take the series four games to one. 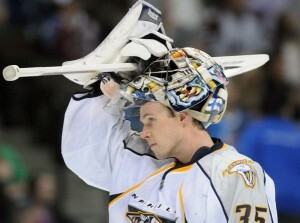 One of the main reasons the Preds were able to knock of the Wings was the stellar play of netmnder Pekka Rinne. In the series Rinne stopped 142 of 151 shots faced and held Detroit to just 9 goals in the series. The native of Finland played in all 5 games for the Preds going 4-1-0 with a 1.81 goals against average and a .940 save percentage. Rinne’s stellar play comes as no surprise as he made 73 appearances in the regular season for Nashville, going 43-18-8 with a 2.39 goals against average and a .922 save percentage. This season marked the fourth straight year the six foot five net minder made 50+ appearances in the Nashville net. Last season, he was a finalist for the Vezina Trophy and is again considered one of the favorites for the award this season. Looking forward to round two, whoever the Preds face will have a tough time scoring goals as Detroit found out the hard way. Pekka Rinne stonewalls Zetterberg 4/11/12 Rinne is big, quick, and never gives up on trying to stop the puck no-madder how far out of position he is. Nashville has two of the most solid blue liners in the NHL with Weber and Suter playing in front of Rinne, and now with the emergence of Kevin Klein and the possible return Hal Gill, the Preds will be extremely hard to beat. Nashville does need to improve on their power play as they only converted 2 of their 22 opportunities in the series. The Preds lived by secondary scoring in round one as Gabriel Bourque lead the team with three goals and big names like Fisher, Erat, and Suter never lit the lamp. Nashville came into to the playoffs considered a serious threat to win the Stanley Cup and after taking only five games to knock out a solid team like Detroit, and winning two games in Detroit in the process, the Preds have lived up to the hype so far.